Drums by Liam James Gray. Bass is Bob Skeat. Jamie Pipe plays Hammond Organ. All Guitars and Vocals are JV on this one. Drums by Steve Rodford. Bass by Jamie Mallender. Hammond Organ – Jamie Pipe. All Guitars & Vocal JV. Drums – Steve Rodford. Bass – Roger Inniss. Hammond Organ – Jamie Pipe. All Guitars & Vocals – JV. Drums – Steve Rodford. Bass – Roger Inniss. 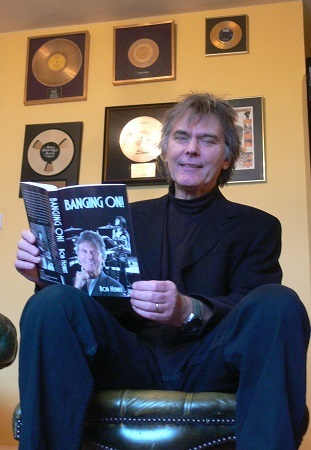 Keyboards – Ian Gibbons. All Guitars & Vocals – JV. Drums – Steve Rodford. Bass – Bob Skeat. Piano – Bob Fridzema. All guitars, and Vocal – JV. Guitar – Max Milligan. Vocal – JV. Drums – Liam James Gray. Bass – John Gordon. Hammond Organ – Jamie Pipe. Backing vocals – Bianca Kinane & JV. Guitars – JV. Drums – Liam James Gray. Bass – Bob Skeat. Organ – Jamie Pipe. All Guitars, and Vocal – JV. All guitars, Vocal & Bass – JV. JV & Jayne Tretton on background vocals. Written by Chris White & Rod Argent. Drums – Liam James Gray. Bass – Bob Skeat. Guitar/Vocal – JV. Recorded live at the Jim Marshall Auditorium, the Stables Theatre, Wavendon June 24th 2017. Initially I put down what was meant to be a guide track on my little Vintage VE8000PB parlour acoustic guitar, however it worked so well with the rest of the guitars that I added later that I left it on the track. The next guitar part to go down was the electric rhythm part, and for this I used my regular stage rig (pictured) with the Effectrode Blackbird units driving both the Supro Royal Reverb and one of my trusty 18 watt Verity Baby Beano amps. For the solo and fills it was the same setup, but with the Pigtronix Aria pedal kicked in for extra sustain. All electric guitar parts are my Fret King Corona JV - the sunburst one which is stock for rhythm parts and the gold one for fills and solo which has Bare Knuckle Trilogy Suite fitted. On this track it's Bob Skeat on bass, Liam James Gray on drums and Jamie Pipe on Hammond Organ. I did all the vocals on this one including harmonies. Meant to be a live feel, I stuck to my standard live rig for this one so it's Fret King Corona JV (stock) with both Effectrode Blackbird pedals through the Supro & Verity via the Lehle SGOS splitter. On this track it's Jamie Mallender on bass, Liam James Gray on drums and Jamie Pipe on Hammond Organ. For the the rhythm guitar parts I wanted old-school so used my little 5E3 amp with the beautiful '63 Gibson SG Junior given to me by my friend Mally Jackson. The Junior came out again for the fills and solos but this time through my stage rig - Blackbirds/Supro/Verity. On this track it's Roger Innis on bass, Steve Rodford on drums and Jamie Pipe on Hammond Organ. I did all the vocals on this one including harmonies. 4. The Blues is my Business. When laying down the drum track for this one with Steve Rodford I used Steve's Line 6 Pod for the guide guitar part, thinking it wouldn't be used on the finished article. Guess what... it really worked from a 'feel' point of view so I had to keep it! So, it's still there, the rhythm guitar part in all its digital glory... For the rest of the guitar part I went back to my stage rig - Blackbirds/Supro/Verity with the Lehle SGOS splitter. I used 'number 3' Fret King Corona JV on all the parts on this one, pickups - Bare Knuckle '62 Veneer Board. 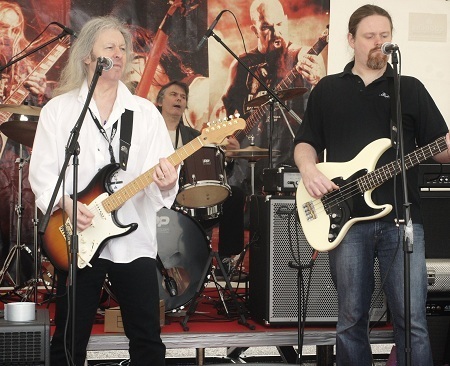 On this track it's Roger Innis on bass, Steve Rodford on drums and Ian Gibbons on keyboards. I did all the vocals on this one including harmonies. Time to pull out the the Marshall JTM45 for this one, paired with TwinStomp Booster and Overdrive. Pretty basic stuff but it works... I used the gold Fret King Corona JV (Bare Knuckle Trilogy Suite) for all the guitar parts. On this track it's Bob Skeat on bass, Steve Rodford on drums and Bob Fridzema on piano. Only one guitar on this, played by the amazing Max Milligan, and a vocal by yours truly. I pulled out the 5E3 again for the rhythm parts, together with 'number 3' the Fret King JV with Bare Knuckle '62 Veneer Board pickups. Fills and solos are on No 1 Fret King Corona JV through my stage rig. On this track it's John Gordon on bass, Liam James Gray on drums and Jamie Pipe on Hammond Organ. Vocal harmonies on this are me & the lovely Bianca Kinane. I used my stage rig for the main lead parts on this, with either the gold JV Corona (driven) or Gibson SG Les Paul Custom (clean) parts. The arpeggio guitars are number 3 Fret King JV/ BKP '62VB through my Marshall JTM45. On this track it's Bob Skeat on bass, Liam James Gray on drums and Jamie Pipe on Hammond Organ. Acoustic guitars are my Gibson JV45 Custom. Electric parts are on the gold Fret King Corona JV/BKP TS through the Supro Royal Reverb. On this track it's Liam James Gray on drums and me on bass. Vocal harmonies are me and Jayne Tretton. 10. Hold Your Head Up. Live rig (obviously) gold Fret King Corona JV/ BKP TS into Effectrode Blackbirds/T-Rex Replica Delay/Lehle SGOS into Supro Royal Reverb & Verity Baby Beano. On this track it's Bob Skeat on bass and Liam James Gray on drums. Recorded at the Jim Marshall Auditorium, Stables Theatre, Wavendon, Milton Keynes. The 'Fret King Black Label Corona JV Signature' my main guitar on stage and in the studio - my pride and joy! Each of these guitars has the signature JV sound, but with a slightly different flavour from each one. I love them all! The core of my tone - Effectrode Blackbird. I use two of these as a tube/valve front-end for everything I do. 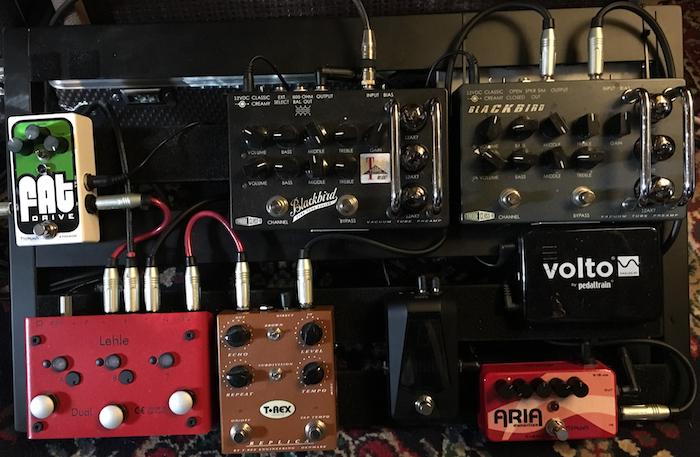 My amps are basicically set flat and the Blackbird does the rest - lovely cleans, and then my slightly overdriven/hot sound that cleans up nicely with the guitar volume control. Lovely! Hear one on every electric track of the new JV album - 'BLUE TO MY SOUL'. 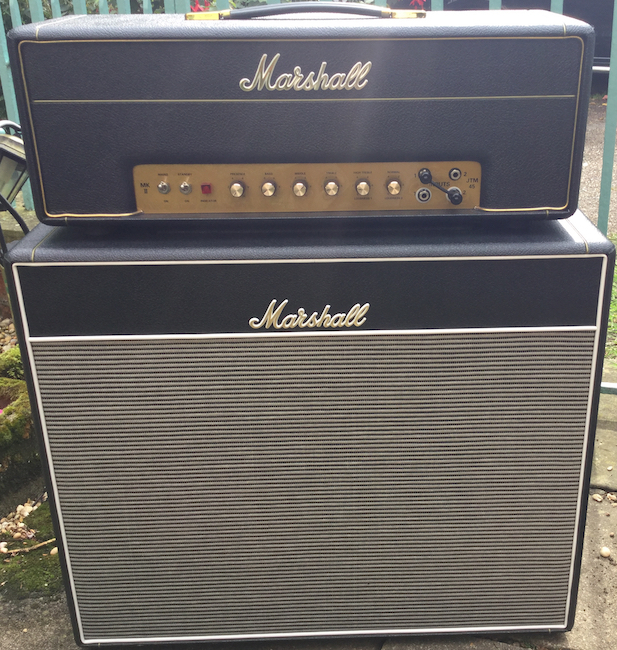 Current stage amp setup - JV Baby Beano with Supro Royal Reverb. BB has 2x10" speakers made by Tayden in ENGLAND! The Supro has 2x10" U.S designed speakers. I'm now using a ScottDixon DB212 cabinet for my JTM45, loaded with Celestion Creamback Neo speakers in the studio. If I need to extend my backline in a live situation I'll augment the Beano/Supro setup with a Blug Amp1 driving the ScottDixon DB212. Paul at Tayden very kindly voiced some speakers especially for me following discussions we've had about what I'm looking for in speakers for my Baby Beano amp, and the results are spot-on. specially voiced versions of his 'True Brit' (10") drivers. It's JV Fret King time! Sounds better than I could have hoped - well done Trev (Trev Wilkinson) you're a genius! The actual guitar is in 2-colour sunburst - no red paint to obscure the vital resonances required to get the authentic JV sound! Don't be fooled by the 3 single coils - there's a further coil hidden under the scratchplate that ups the output considerably..! 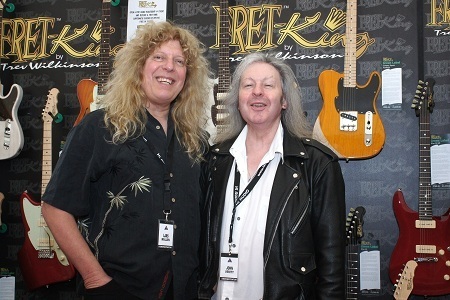 JHS Event - JV at the Fret King stand with the very handsome Lars Mullen! A hugely entertaining memoir of the legendary British drummer whose unerring sense of timing and rhythmic flair provided the rock solid base for Adam Faith, The Roulettes, The Kinks, Argent, The Zombies, Don McLean, Richie Havens, Ringo Starr, Colin Blunstone, Unit 4 + 2, Honeybus, Richard Anthony, Roger Daltrey, Leo Sayer and Ian Mathews. Illustrated with a wealth of photos and personal recollections of Keith Moon, Cliff Richard, David Bowie, The Shadows, Queen, The Hollies, Sandy Shaw, Genesis and many more whose music will forever echo throughout the airwaves and digits of the world. Born in 1944, Bob Henrit grew up in Hertfordshire and was educated at a Catholic college. Having mastered the washboard by the age of twelve, within a short time he was playing drums for Adam Faith. 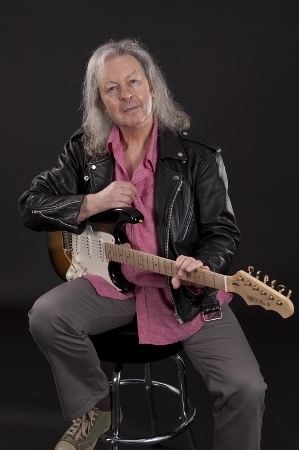 A founder member of Argent, he went on to play with (among others) Don McLean and Richie Havens, before joining Ray and Dave Davies in The Kinks. 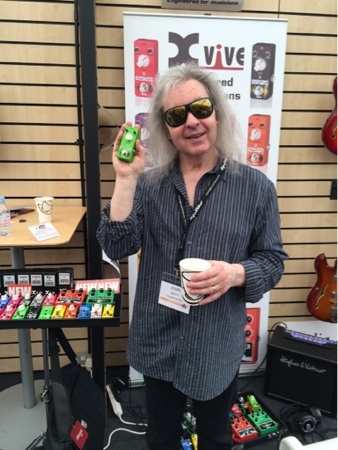 He’s had a diverse career in music as player, writer, film-maker, broadcaster, drumstore owner and inventor. Happily married with three children and two granddaughters he lives with some of them in Enfield. His time is spent writing, reading, public-speaking, travelling, indulging in various sports and, of course, drumming.